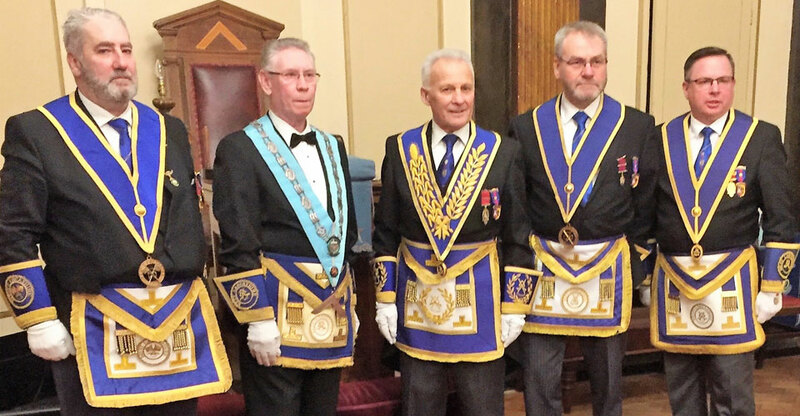 The Roman Suite, within Liverpool Masonic Hall, was the venue for the latest annual installation ceremony of Victory Lodge No 6238. Due to a number of officers of the lodge being unable to make the meeting due to illness and occupational commitments, Gordon Lees occupied the senior warden’s chair, while his twin-brother Eddie occupied the junior warden’s chair. 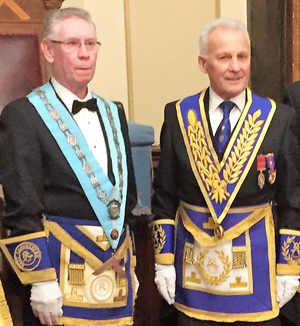 Both are well skilled in all aspects of ceremonial connected with the lodge, with Gordon serving as WM as long ago as 1970 and Eddie the following year. Peter McCarthy (left), with Martin Lockyer. The lodge was opened in the first degree by WM Eric Palfreyman and the notice convening the meeting was read. On completion of the usual business agenda, the assistant director of ceremonies Len Shepherd, standing in as DC, requested the permission of the WM to leave the lodge for a short while, accompanied by two brethren Peter Rastall and Brian Leatherbarrow, who were acting as Provincial deacons. Len returned to the lodge and announced that Martin Lockyer, representative of the Provincial Grand Master, stood without, accompanied by the Liverpool Group Vice-Chairman David Johnson, grand officers John Roberts and Roy Ashley, with acting Provincial grand officers Barry Fletcher, Harry White and George Christie. Eric warmly welcomed Martin and hoped that he and his accompanying entourage would enjoy the evening and the hospitality of the festive board later in the evening. For the purpose of the installation ceremony, the two Lees brothers were asked to remain in their chairs for the duration and Dave Constantine was asked to assist and honour the lodge by occupying the position of inner guard. George Strickland and Brian Leatherbarrow presented Peter McCarthy, master elect of Victory Lodge to the WM to receive at his hands the benefit of installation. Prior to beginning the ceremony, Eric Palfreyman thanked the brethren of the lodge for their assistance throughout his year in office. Brethren below the rank of an installed master were asked to leave the lodge room. The board of installed masters was opened and Eric installed Peter as WM of Victory Lodge according to ancient custom and Paul McLoughlin presented and explained the working tools of a master Mason. On completion of the ceremony, Peter proceeded to appoint and invest his officers for the year. John Roberts gave the address to the WM, Colin Cameron gave the address to the wardens and Jim Whisker gave the address to the deacons. Martin Lockyer gave the address to the brethren and congratulated the WM on behalf of the Provincial Grand Master and hoped that he and Victory Lodge have a very good and happy year. He also congratulated the brethren who had taken part in the ceremony. Peter’s first duty as WM was to present Martin with three cheques on behalf of the Lodge. The first being in favour of £400 to the Liverpool Masonic Hall, the next for £150 to the Liverpool Down Syndrome charity, with the third for £150 for Huyton Sea Cadets. The lodge was then closed and the brethren moved into the festive-board. Pictured from left to right, are: George Christie, WM Peter McCarthy, Martin Lockyer, Barry Fletcher and Harry White.